Home » Decorating Resources -- Also note those subcategories in the orange navigation, above! 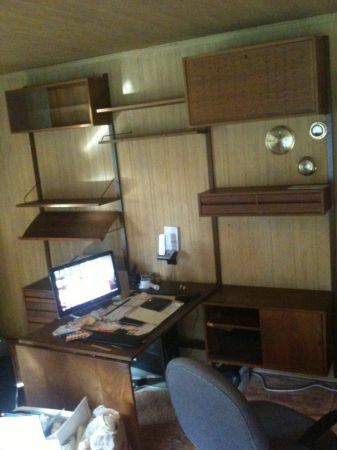 » Storage & Shelving » Open base cabinet shelving for my office craft room: Help! Base cabinets with open shelving that are 24″ front-to-back (like kitchen cabinets), so that I can add a 25″ deep work surface counter on top. The overall installation needs to be 36″ high – also just like a kitchen. The inside sides need to have those little pegs on the side to you can adjust shelf sizes. I’ll add brass grommets. 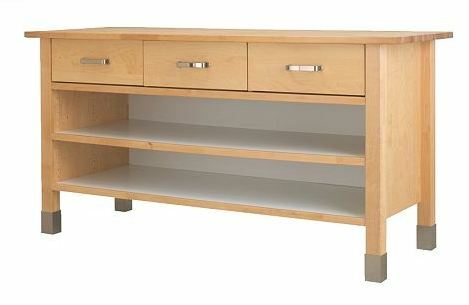 In my dreams, chunky natural wood frame, with white shelves. In my dreams and here’s where it gets really complicated: I’d like the design to allow me to adjust the width of the shelves and back and therefore, the width of the cabinet to fit the exact dimensions of my space. 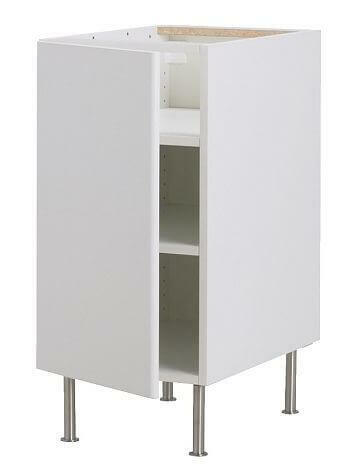 Like: The legs and side pieces would be a fixed depth and height (24″ deep, 36″ high with the legs and counter). 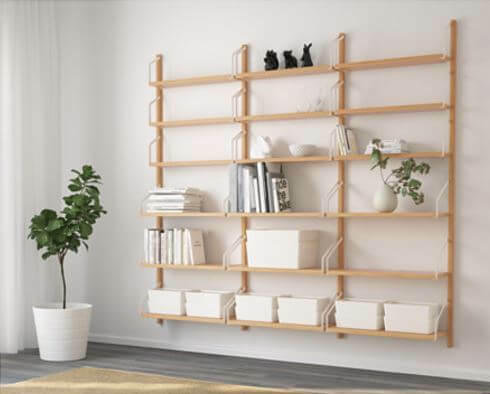 The width of the shelves and back (if you wanted a back) could be adjusted easily by cutting down the shelves or using different sizes of shelves. 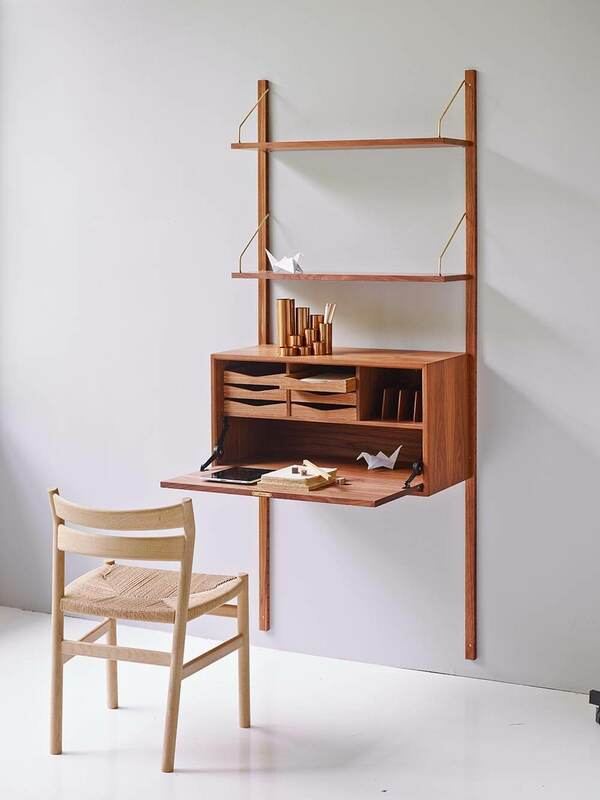 Affordable — considering I am talking about a simple wood frame, and am fine with piney legs and MDF shelves. 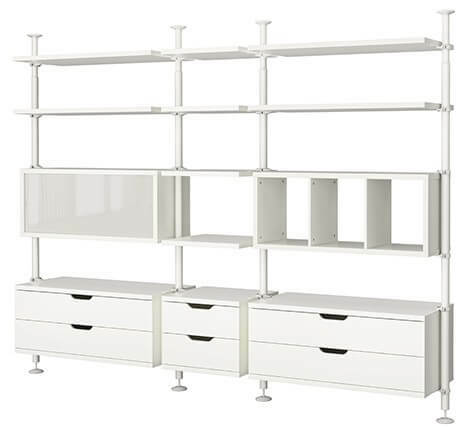 Kinda sorta like the Ikea Varde freestanding kitchen cabinet unit (above) — but my design need to be shelves only and needs to be infinitely adjustable in width. Haha, that’s all I need: “infinitely.” Does anyone know of something available to suit my needs?? I have already spent, like, 30 hours online looking, and I am finding it’s constitutionally impossible for me to “settle“. Meanwhile, I am doodling a design of my own — one that tries to use stock lumber and woodworking pieces — even though I have never tried to design furniture before. Do you know of anything out there that might fit my demanding criteria?? If it were my project, I’d draw it on paper and get estimates from locals who could construct it for me. You’d get exactly what you want and can make changes during construction if need be. We’ve been having the same problem with our bathroom vanity, and have been down the Ikea road (and back). Finally found a basic vanity at the ReStore (for about $10, I think), and we put retro furniture legs on it (from Ace Hardware), and Cane added some shelves to the side of it. Don’t have the whole project ready to post yet, but we wrote about all the things that didn’t work. Like you, we got to a place where we were pretty particular about what we wanted. I think the ideas about finding an existing piece and modifying it are good ways to go. The doors are sold separately, because IKEA sells one set of base cabinets and offers a bunch of different door choices. I’ve never ordered online, but I know that in the store, you can just not have the doors added to the order.